It's not clear who hacked the forums, but Fkn0wned.com is denying responsibility, writing this on its own site: "Fkn0wned Forum is currently unavailable In lights of someone crediting us for the recent breaches of steam forums, the board is offline. Fkn0wned is not responsible." Some users reported getting email spam apparently from Fkn0wned.com after the hack, and the forums are, at the time of posting, offline. The Steam User's Forums and the Steam service account passwords are separate, but some users might use the same handles and passwords across both. 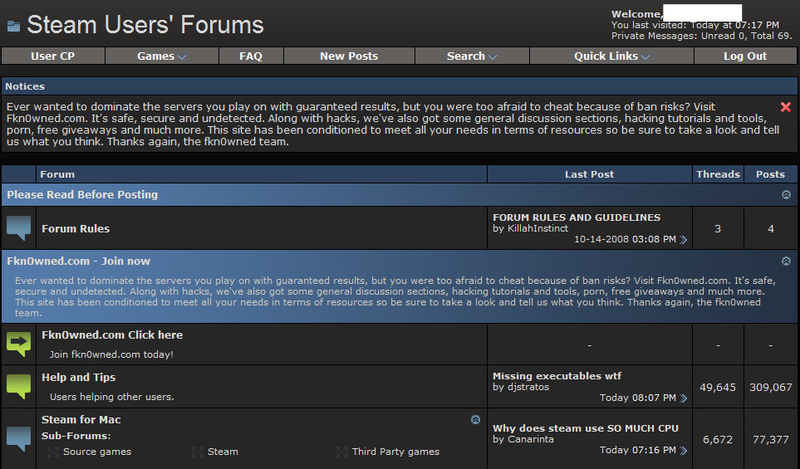 If that pertains to you, it might be a good idea to change your Steam account password. And pronto. Kotaku is following up with Valve and will update this post should the company comment.